When it comes to game resolution systems, the question each system attempts to answer is fundamental: Is it interesting to either fail or succeed? If either the failure to perform an action or the success in performing an action is interesting in terms of the game outcomes, that’s when you allow fate to intervene (i.e. roll dice or use whatever resolution mechanic exists). If the either/ or isn’t interesting — if it does not provide a new choice to be made — don’t roll dice. At best, they’re an obstacle in that case. At worst, you’ve created a false expectation for the player. And note that, adjudicated wisely, even failure can yield information. In this case, the fail state indicated which direction not to go, pointing the players toward another decision on the manner of approach. 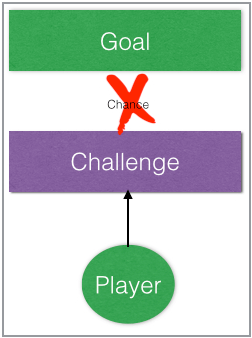 It’s important to construct your game progressions so they don’t rely on a certain die roll — again, unless the failure to achieve that progression is part of the game. If the players can’t find the clue because they failed a die roll, that stops the game. If the players can’t find the clue because of a certain die roll but they have other avenues of progressing the game available to them, that’s fine, but only if the possibility of exhausting the failed avenue leads them to another decision point. Relying on dice or other randomizers to determine an outcome skews the game away from a game of decisions toward a game of chance. 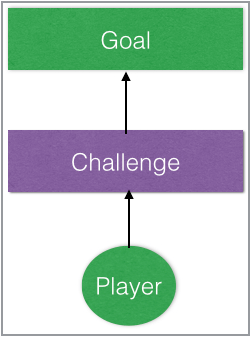 Skill systems, in particular, which can create choke points in either information flow to the players or can block narrative progression, are particularly susceptible to these systemic blockers. “We have exhausted our options because the dice say so” is bad game design, as it subsequently prevents players from interacting with the game and making the decisions that are fundamental to the definition of gameplay. 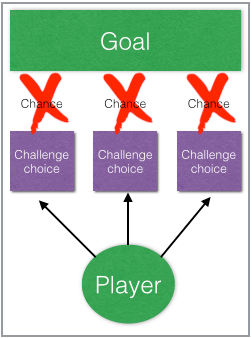 The players know what they need to do and how to arrive at the goal, but have minimal to no control over that action’s success. 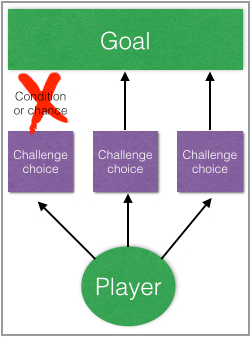 The players know what they need to do and how to arrive at the goal, but have minimal to no control over that action’s success. Even worse, they have the illusion that their choice really matters, when it ultimately comes down to chance. Important: Remember, this is not an argument against all dice rolls, but against dice rolls that would result in a hard stop in the progression of the essential experience.